Written by Colleen Sedgwick on September 13, 2018 . Posted in Uncategorized. Hey, guys! My strategy for you today is the Know, Like and Trust Factor. I was out and about early this morning. I had to be at the hair stylist by seven o’clock to get my hair done. The Pet Nanny Coach site is being updated (I can’t wait until you see it! ), and I needed some fresh, new photos (if I see that picture of me with Dr. Watson one more time. . . !). I wanted to get new pictures taken for my new site, and this got me thinking about your websites. There are so many that I visit and I don’t see anything of you anywhere on your site! I’m not saying I don’t understand, because I did the same exact thing with my first site. I didn’t want to be anywhere on there. 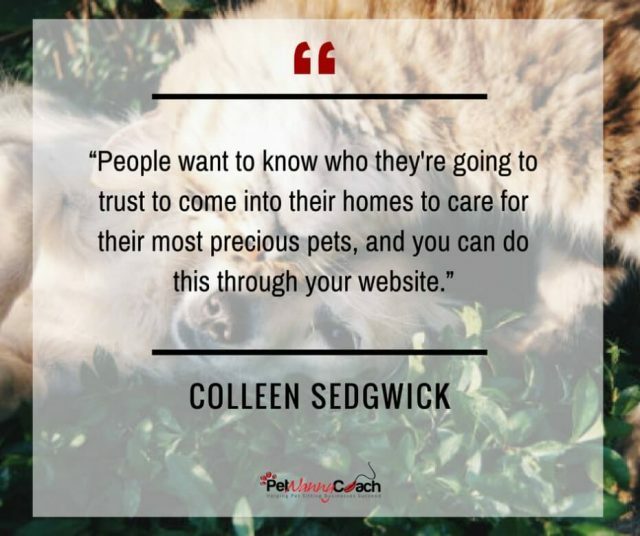 I had pictures of pets everywhere, but Colleen was nowhere to be found until my business coach taught me the importance of the Know, Like and Trust Factor. What is the Know, Like, and Trust Factor? So, what is that? It is giving the people the opportunity to know, like and trust you through your website, because people like doing business with people. People want to know who the owner of your business is. People want to know who they’re going to trust to come into their homes to care for their most precious pets, and their homes and their prized possessions, and you can do this through your website. So, my challenge for you is first, to create a video on the homepage of your website – face to camera. You need to look at the camera and say, “Hi, my name is Colleen Sedgwick. I’m the owner of Pet Nanny, and my pet sitting company rules, and this is why.”. You want to let them know who you are, what you're about, what you stand for, and what your values are. Click To Tweet I can promise you this – you are going to see a huge uptick in the number of new clients that you get from visitors to your website. They’re going to have a connection with you through the video, and they’re going to get to know, like and trust you. The second part of this challenge is to look at your “About” page and spruce that page up! Your About page is the second most-visited page on your website, after your homepage. So, you really want to make this page shine. Let them know what organizations you belong to. Are you involved in rescues? Anything that is going to open a little window into who you are is going to make a huge difference. Your website visitors are going to begin to know, like and trust you right from the get-go, and you’re going to sign up clients much more easily than when you were not showcasing yourself. So get out there and complete this challenge! Create a face to camera video to put on your homepage, and spruce up that “About” page and show people who you are. All right, guys, I am wishing you a great day. Take care!